If your dog needs something new to play with that’s easy on their mouth and fun to play with, you need one of the best dog frisbees. We’ve assembled a great list of frisbees to help you pick one that is great for you and your dog. Our list will help you identify what you should be looking for in dog frisbee reviews. Material: The material is something important to consider. Things like hard plastic can be really rough on your dog's mouth and teeth, and could possibly break and harm your dog. Size: The size of the disc determines how easy it will be for you to throw and your dog to catch. Try to choose a size that correlates to your dogs- small, medium, or large. Colors: The color is something important to consider as well, but is a personal preference. Bright colors can be easier to find if you overshoot the throw or your dog misses the catch. Tear-Resistant: A tear-resistant frisbee can make it easy for you and your dog to get lots of playtime out of this frisbee. If your dog is really rough on toys, definitely get a tear-resistant one. Floats on Water: If your frisbee floats on water, it is easy for you and your dog to take playtime anywhere. This is something you should definitely consider if you spend a lot of time around the water. Non-Toxic: A non-toxic frisbee is definitely something to consider if you think your dog is going to spend a lot of time chewing on it. Many frisbees are made with non-toxic material. So now that you know what to look for in a dog frisbee review, let’s get right to our awesome list. Our Dog frisbee buying guide will help you choose an awesome frisbee that both you and your furry friend will love. Our top and budget picks are perfect places to start for anyone who is looking for something that is the best of the best. We’ve also included eight other awesome options for you. Our top pick is one of the best frisbees to buy for people looking for a durable frisbee that will last through the years. It comes in three colors so you can choose one that stands out to you. You could even grab all three! The colors available are blue/orange, max glow, or a two pack with both. The max glow option glows in the dark so it's perfect for anyone who loves playing with their dogs at night. It comes with a glow in the dark rubber ring on the bottom, which is helpful for finding your frisbee even after months of wear and tear. These frisbees float on water, so they’re perfect for any kind of environment. This makes it the perfect choice for adventurous dogs. They are designed for flight and are easy to throw. They are soft and flexible, which not only make them fly better, but it makes them a great choice for travel. Our budget pick is a perfect choice for anyone looking for the best dog frisbee for chewers. Kong has a long history of making awesome products that can stand up to even the roughest of dogs. This frisbee comes in two sizes- small and large. You can also et a two pack for either small or large sizes. This makes it easy to have one for home and one for travel. This frisbee is perfect for playing fetch anytime and anywhere. It is durable while still being soft n dogs teeth and gums, so you won’t have to worry about your dog suffering damage from your playtime. 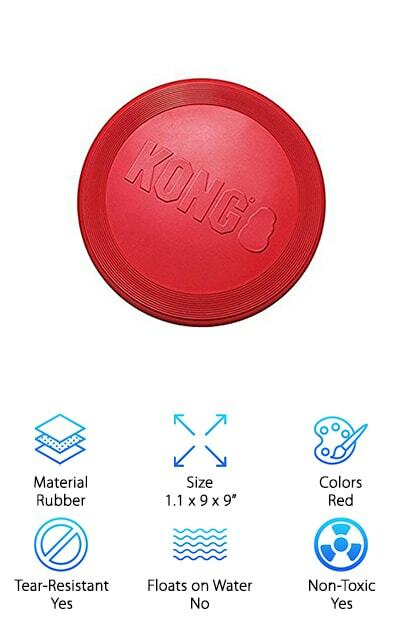 This is made of Kong durable rubber, so you can be sure it will last you a long time. This product is made in the USA, so it's perfect for people who want to buy products made in the country. This is a great choice for any dog owner looking for a great frisbee. This cute flyer is a perfect choice for dog owners who constantly lose their frisbees. The bright neon pink and green is used to stick out like a sore thumb so you can always find it. This frisbee comes in 7, 10, and 12-inch sizes so you can find something perfect for you and your dog. This is a great choice for anyone looking for an incredibly durable frisbee that can stand up to rough days of playtime. This frisbee flies easily so it's easy for anyone to throw accurately. It is also flexible, so it’s easy to take with you anywhere. It also floats, so you can play in the water as well. This frisbee is made of a soft and gentle material that is easy on your dog's mouth. This doesn’t make it less durable though. This is the perfect frisbee for any size dog and any kind of playtime. This is a great frisbee for anyone looking for something that comes in lots of different sizes and colors. This toy comes in pink, green, and red, making it easy to find in any kind of terrain. This toy is made of soft rubber and durable nylon the manufacturer has tested it and it complies with children’s toy standards. This makes it the perfect choice for anyone who wants to make sure they are getting something safe for their dog. This can help give you and your dog hours of interactive playtime, making it easy for your dog to get the exercise it needs This frisbee even floats in water, so you can take your adventurous dog anywhere. This is the perfect toy for anyone looking for something durable that they can take with them anywhere. This awesome frisbee is easy to throw and can be used in almost any environment, making it perfect for any trip or even just using at home. The awesome flyer comes in two different sizes- large and mini. The large size is perfect for using around the house and the min size can be thrown in any on the go bag for playtime anywhere. This frisbee comes in six awesome colors that make it easy to find which frisbee is yours or to find it in rough terrain. The colors available are- light blue, black, granny smith apple, tangerine, and stark white. This makes it easy to grab a few frisbees and keep them straight by color. This frisbee is perfect for fetch at home or on the go. It floats on water so you can take it with you anywhere. It is soft on dogs mouths but is easy to throw and durable. This is a great alternative to a hard plastic frisbee, which can be difficult for dogs to play with. This frisbee is even guaranteed against dog damage by the manufacturer. This bright frisbee is perfect for anyone who is sick of losing their frisbee in the treed. It’s bright green color makes it easy to find anywhere. This is a perfect choice for anyone on the hunt for something durable that their dog will love. 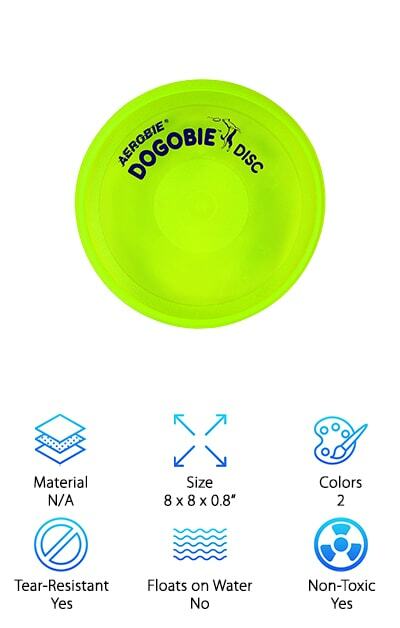 It is double sided, which gives it a unique advantage over other frisbees. It will allow you to give a different flight disk path depending on which side you throw it from. This frisbee is made with a new design and a modern and unique material that makes it easy to throw. It’s a perfect choice for anyone looking for something easier on their dog's mouth that straight hard plastic. The disc flies like a great frisbee and allows you to get a great range. This frisbee is even made with nontoxic material that allows you to feel good about letting your dog play with it. The best frisbee dog breeds need the best frisbees to keep them occupied. This awesome frisbee is a great choice for anyone who wants something that is perfect for all dog breeds. This frisbee is made specifically with the dog's ability in mind. While bright colors like green, orange, yellow and red stand out to human eyes, dogs have a different visibility spectrum. The most distinct and bright color for dogs is blue, so this frisbee is very easy for them to see in the air. This frisbee is made with an aerodynamic grooved design which makes the Frisbee keep flying with just a flick of the wrist. This makes it easy for anyone to throw. This frisbee is made of soft natural rubber. This means it won’t shatter or splinter like typical plastic frisbees. This company even promises that if your dog chews up this frisbee they will replace it. This awesome disc is incredibly aerodynamic and is perfect for dogs who love to run far for their frisbee. This is a perfect disc for dogs because it's made specifically with them in mind. It is made of soft materials that are gentle on a dog’s mouth and teeth. This makes it the perfect choice for people who are looking for something better than a hard plastic is for their dog's playtime. It is puncture and tear resistant, making it great for lots of playtime or dogs who are rough on their toys. This frisbee is made with an aerodynamic design that is easy to grip, It also makes it easy to throw accurately and catch. This frisbee is a perfect choice for anyone looking for something that is made specifically for dogs. This is a great way to get your dog outside and exercising. This is a great way to bond more with your dog on the weekends. If you’re looking for something awesome that can help you get ready for a professional dog frisbee, consider this awesome option. This durable foam makes it easier to throw straight and can get both you and your dog practicing for the big leagues. This is the perfect choice for inexperienced frisbee throwers. This frisbee is made from an extremely durable patented material that is safe for your dog's teeth and gums. This makes it a great choice for anyone who is worried about harming their dog with a hard plastic frisbee. This frisbee is also easier to throw straight. It even floats on water so you can play with it at the beach or lake. This frisbee is lightweight and easy to take with you everywhere. This makes it a great pick for anyone looking for something easy to travel with. This makes this frisbee one that sticks out from the pack as a perfect frisbee for beginners. This awesome frisbee is by one of the biggest names in dog toys. 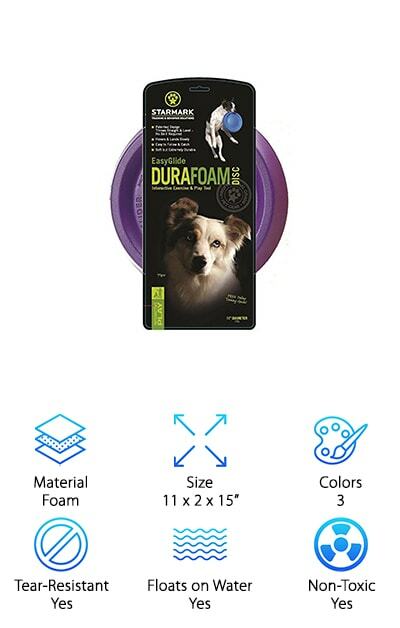 This frisbee comes in three colors and you can even choose a multipack if you know your dog will tear through frisbees fast. This is also a great option for anyone who needs one for travel and one for home. This frisbee comes in three colors-blue, orange, and red. This makes it easy or you to choose a color that you love and your dog can see easily. This frisbee is made of tear-resistant nylon, so you won't have to worry about your dog ripping into it on the first time you use it. 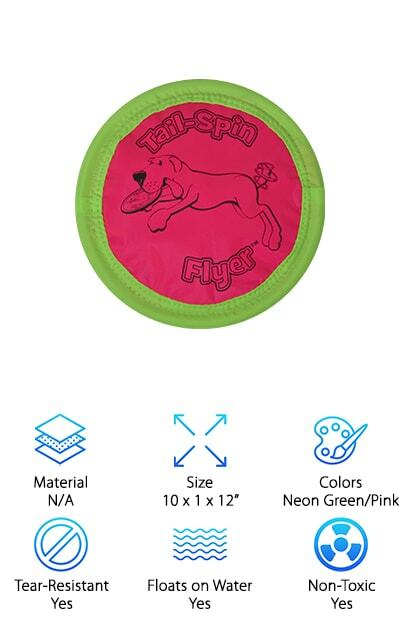 This frisbee comes in bright colors that are easy for you and your dog to see, even if the catch gets missed and it lands in the weeds. This frisbee can provide hours of action-packed play for your dog. This makes it easy to get some great quality playtime.